Working memory problems are an often overlooked difficulty in the classroom. Working memory problems are an often overlooked cause of students' obstacles in learning new information. Children with poor working memory may have difficulty learning new letters and words, and understanding the gist of general and specific classroom tasks. Working memory is the information we attempt to hold in our head just long enough for us to use or manipulate it. Working memory is fleeting. Try to think of working memory as a series of post it notes. We quickly write down new information on the little yellow pad, and either transfer the information later for permanent storage, or, what generally happens at my desk, get distracted and lose the note. The information thus vanishes into the ether. A recent example of a working memory blow out happened when I recently travelled to the local supermarket. I needed ingredients to make an enchilada, something I had never attempted before. I quickly scanned the ingredients in the recipe book and was confident I had the list of foods well memorized. I was wrong of course. By the time I got to the supermarket I had forgotten at least five items. And the reason was this: I had no previous experience making enchilada. I couldn't draw on any background knowledge of making it. There was no meaningful context for me to draw upon. So the mental list of ingredients, with no context to tie the new information to, vanished in a puff of smoke from my mind. Presumably, something similar to my shopping experience happens to young students in the classroom. Students with working memory difficulty have problems with any complex task that requires them to listen and remember specific instructions from the teacher. Clearly, some essential information has been lost. The problem becomes more noticeable and problematic when children learn more decontextualized information, such as new word lists or new grammatical concepts. Part of the reason why children with working memory deficits forget new information, is often to do with limited storage capacity in their mental workstation, and difficulty with processing. The information provided in the monthly newsletters is ideally suited to be used by speech-language pathologists, teachers and parents of language impaired students. Once you've signed up to the Language Dispatch you'll also receive a new free Idioms ebook, On Cloud Nine. 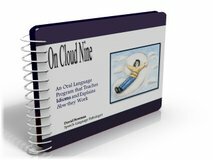 The On Cloud Nine Program features 100 context based scenarios, and a multiple choice format to effectively teach this difficult figurative language concept. The program is very easy to use and is yours free, once you've signed up to the Language Dispatch. The program is available as an Adobe pdf download.